Night Beats head up an evening of ferocious fretboard action, Getintothis’ Sean Bradbury finds some special magic within the fury. 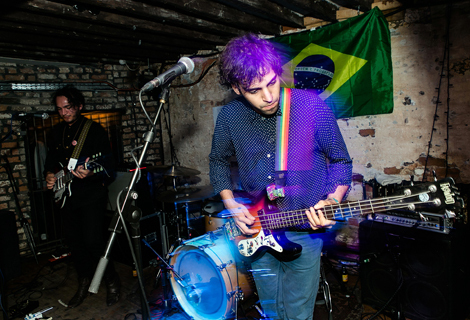 ‘Sloppy and shiny‘ are the watchwords of Hooton Tennis Club judging by their presence on the band’s Twitter, Facebook and SoundCloud profiles. Maybe that’s about right – to sum them up in a hasty sound bite, if would be tempting to go for something like ‘slacker rock with a layer of pop polish’. But let’s not undersell: these accomplished songs haven’t just been churned out by gazing at shoes and lazily strumming guitars. Doing slack well requires structure and melody underneath the noise and Hooton Tennis Club nail it on this evidence. At their poppiest – Kathleen Sat On The Arm Of Her Favourite Chair and Jasper perhaps – the music bops along in hazy, Teenage Fanclub fashion. But there are several different gears on show. They hit harder, heavier and fuzzier on Plucky. 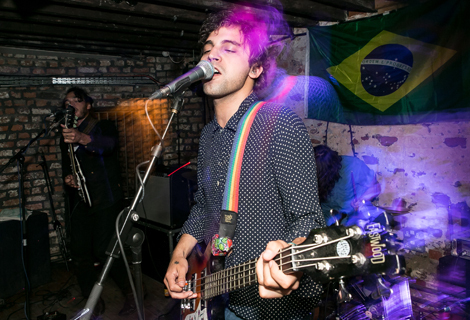 Spokes would slot right in as a dark, dreamy coda on the end of The Modern Lovers debut album and I’m Not Going Rose’s Again provides a wonderful flourish to finish – whirling circles of garage rock, the gaps filled with ragged vocals and reverb-soaked lead lines. 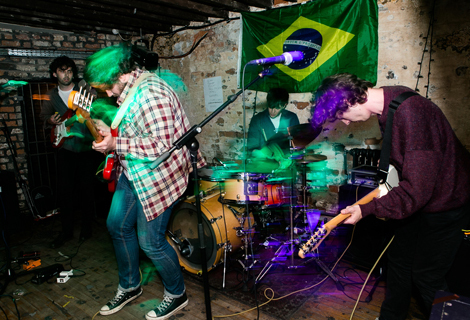 Strange Collective take the second support slot and deliver an unrelenting half hour of tight, psychedelic tunes. The rhythm section runs in perfect stride withs bass and drums (Michael Robinson of Sankofa and WYWH‘s Andrew Parry) delivering the thunder while Ali Horn’s guitar and army of effects pedals provide the lightning strikes. Even in the downtime Alex Wynne‘s vocal hollers and howls keep things ticking over. 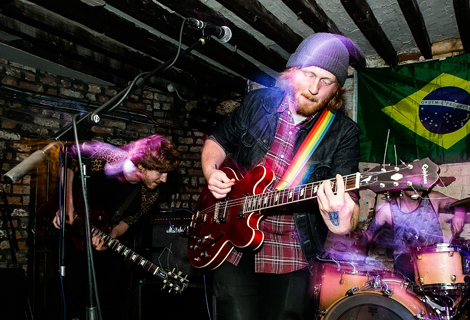 When Strange Collective breathe in they sound like a wilder Black Rebel Motorcycle Club, but when they exhale and let loose it’s a full on dirty desert party with mescaline sours all round – as if Queens of the Stone Age were jamming through some of their favourite 70s psych-rock records. Night Beats emerge and begin by pulling the plug on some of the stage lights, making the Shipping Forecast even dingier and more appropriate for their short, sharp, snarling shocks of psychedelic soul. It’s a sight and sound to behold, akin to The Black Keys but with driving rhythms in place of Junior Kimbrough shuffles: twisted twelve-bars of motorik blues and hallucinogenic flashes of lead guitar. Just as they settle into a groove it is gone, but the next one locks in without a moment’s hesitation. All in all it was a great night: a well-balanced bill with great local support acts threatening to upstage the headliners who seemingly rose to the challenge. 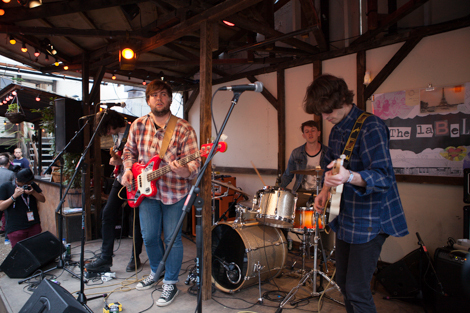 Pictures by Getintothis’ Tom Adam. Real Estate head for Liverpool this Autumn. SOHN readies UK tour including Kazimier date in September. Getintothis on new electronic Mersey duo Adronite‘s debut EP. By The Sea return with I See A Crystal Sky ahead of summer second album release. 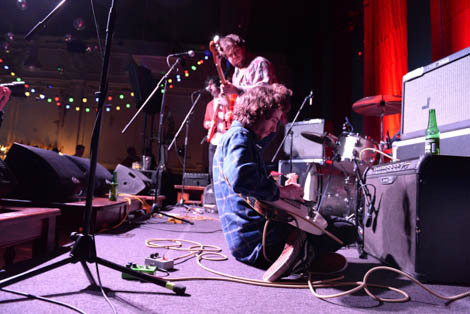 Night Beats at Liverpool Psych Fest 2013 review, picture gallery. Getintothis reviews Strange Collective with King Khan at Korova.